All new. All electric. Zero Emissions. 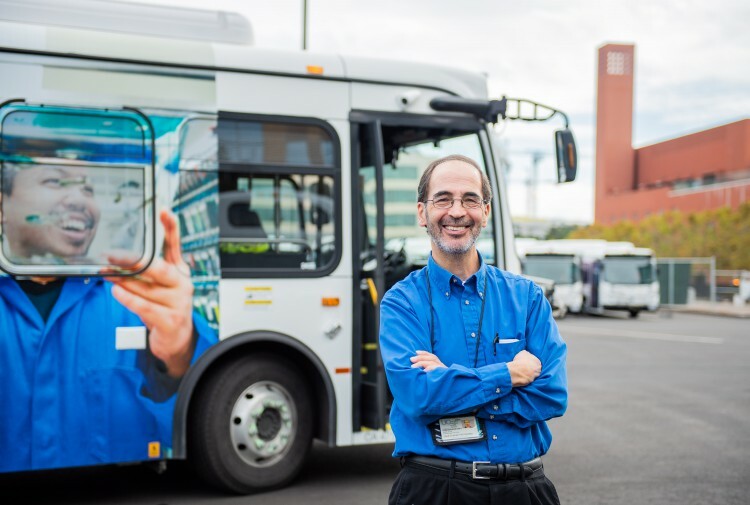 In late 2018, UCSF added 15 new all-electric, zero-emission transit buses to the intercampus fleet that serves UCSF employees, faculty, students, patients and guests. Now, one quarter of the University’s fleet is electric. It’s a major first step toward the goal of an all-electric fleet, and an important milestone on UCSF’s journey to be carbon-neutral by 2025. The San Francisco Chronicle reported “UCSF rolls out new fleet of electric buses to reach carbon-neutral goals” in a news article published September 28, 2018. News of the zero-emission vehicles, and how they will help improve air quality and lessen neighborhood impacts, was also reported by UCSF News: “UCSF Unveils New Electric Shuttles, Moving Toward Goal of All-Electric Fleet” by Laura Kurtzman, Senior Public Information Representative at UCSF. The first electric buses began service Oct. 1, 2018 on the Red line. More electric buses were added to existing routes, with 10 buses deployed at the end of 2018 on the Blue, Bronze, Gold, Grey and Red routes. All 15 buses should be deployed during peak hours by the spring of 2019. The UCSF shuttle system transports about 8,000 people a day, on 16 routes that travel among university campuses, facilities and the 16th Street BART Station. For more information about the electric transit buses, please review Electric Transit Bus Facts.